Early Booking Offer – Book at least 30 days in advance and save up to 20% off the room rate. Please contact us for further details. 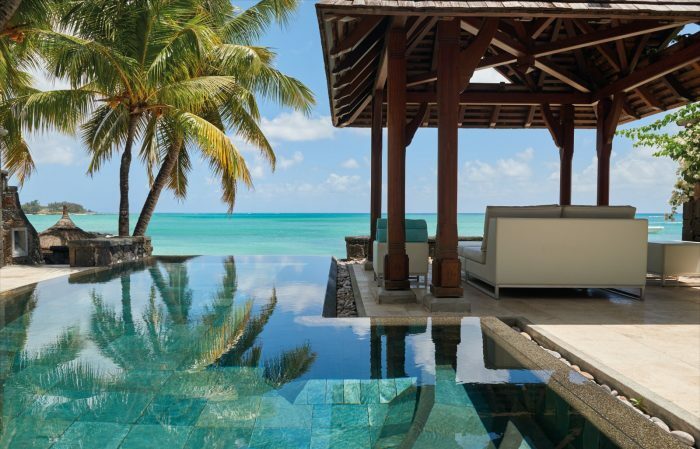 Feel at home in the lap of luxury at Royal Palm Mauritius. With uncompromising standards of excellent the Royal Palm deserves its title as one of the most prestigious addresses on the tropical island. Located in the warm waters of the Indian Ocean, Mauritius is famous for its lagoons, beaches coral reefs and genuinely hospitable people making it such as popular destination for couples in love. The Royal Palm is one of the most exquisite accommodations on the north tip of the isle, sheltered from trade winds. As well as the lushes gardens and desert-island-esque beaches, the range of well-serviced amenities at the resort extends to a business centre, private car hire, helicopter transfers and a jewelry boutique. The Royal Palm’s spa introduces guests to relaxation on a whole new level, with the options of reflexology, yoga, meditation, reiki, hammam steam rooms and saunas. The large living quarters are bathed in natural light from bay windows framing sea views and furnished with wooden furniture hand-crafted by local artisans. Your suite is quite literally your sanctuary containing everything a romantic nest needs, showcasing a large terrace to watch the sun setting, deep bathtub, mini bar and marble bathroom. Early Booking Offer – Book at least 30 days in advance and save up to 20% off the room rate. The 1000 square metre spa, affiliated to the internationally famous brand Clarins, offers relaxation and beauty treatments. The spa features solo and couple’s treatment rooms with bay windows covered by rustic shingle-roofed pavilions. Select from signature treatments, traditional massages, Ayurvedic therapies and even Oriental rituals. Whatever your workout preference, the sports centre has something to suit everyone. With a Pilates studio, cardio and fitness rooms, Kinesis and Power Plate rooms, squash court, table tennis, Bocciball and personal trainers. Surrounded by crystal-clear waters and abundant aquatic life, in Mauritius water sports enthusiasts are spoilt for choice. Choose from water-skiing, windsurfing, kayaking, sailing, snorkeling, pedal boats, stand-up paddle, glass-bottom boat and private boat excursions. Entertainment – In the evenings guests can enjoy the melodies of live singers and musicians from 7pm until midnight. A true paradise for newlywed couples, Royal Palm welcomes you to a world of hospitable excellence with plenty of intimate spaces for you to get closer. From sumptuous multi-area suites, to inviting private pools and a sun-drenched beach, lovers can spend endless days relaxing in some of the most romantic settings imaginable. If you are looking for a secluded retreat boasting translucent waters, powdery white sands and swaying palm trees then look no further than the Royal Palm. The resort is known for its warm welcoming staff who are ready to take care of your every whim with a concierge service and 24-hour in-room dining. What better way to start married life together than on the eulogized isle of Mauritius. The Royal Palm caters for every mood and occasion with an Italian trattoria, a refined international restaurant and a laidback beach bar. international dishes and local specialties with ocean views. Le Bar Plage – Sheltered by a beautiful badamier tree, the casual restaurant and beach bar has an à la carte menu and extensive drinks list. La Brezza – Expect to find traditional and contemporary Italian food paired with high quality wines. The Bar – Serving mocktails, soft drinks, cocktails, wines, spirits and beers both local and imported.